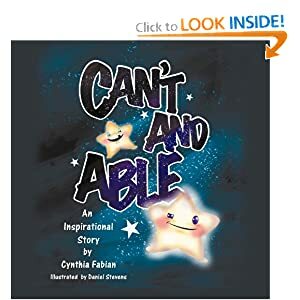 Author Cynthia Fabian announces the release of her third children’s book, Can't and Able. It’s a heart-warming tale based on the story of two stars, who as they grow older find tolerance and self-esteem. Everyone is a star in this book, as Can't and Able uses star metaphors to find characters all children can relate to. The main character, Can’t, is a star who is bullied because of his difficulty to shine like the other stars. He needs to find a way to develop his own self-esteem by believing in himself. Able is the star who had it all. Able helps Can't to realize that he can really shine. It wasn't until Can't realized he Can, that everything changed for him. Find out how Can't became a hero and ultimately became Can. “Can’t is simply going through the growing pains of a star who is feeling very insecure in his circumstances,” Fabian says. But when he learns to believe in himself, life becomes happier and more beautiful for him. Originally from New York City, Cynthia Fabian now enjoys meditation and the quiet life in Somerset, New Jersey. She released her first book in 2009, Those Sweet Nothings, a collection of vignettes for adults depicting dates gone wrong. Since then, she turned to her first passion of children’s books, expressing the theme of overcoming obstacles. Her other books include Second Hand Art and Orchestra in Our Brain. What I love about this story is that it tells us about a star that learns that by being himself he can shine the brightest of all. The book itself was great and the illustrations were such that completely drew you into the story itself and kept you engaged to the very end. As a parent I loved that the story has so much to teach the children who read this about how to deal with things like bullying and negative thoughts of self-esteem. Too often I hear my kids saying things like I can't and I want to be able to help them to get to the point where they to can say I can. Through stories like this you can definitely start giving them ideas for how to get to this point!